On the board is a rotating disc (split into 6 segments). Around the disc are 6 sets of prices for the different marble colours – white is most expensive, then yellow, then red, and so on. When buying marble, the player turns the wheel one section clockwise and draws marble blocks from the bag to bring the total on the wheel up to 11 (placing new blocks in the most expensive segment). The player can then buy any number of marble blocks but only from one single segment of the wheel. The costs are marked next to each segment and these get cheaper (even free) as blocks progress around the wheel. On their turn, a player can build one of up to 9 buildings on display by spending the number of marble blocks (1-5) shown on the tile. There are 30 buildings in total: 5 of each of the 6 different types with a cost ranging from 1-5 in each type. The colours of marble blocks used is up to the player, but the cheapest colour used determines in which cities the player can place the building – the cheaper the marble, the fewer (and lesser valuable) the cities where it can be placed. Mixing marble colours is not efficient, but efficiency needs to be balanced against other factors, like using more blocks to build higher value buildings even if they can only be placed in less valuable cities, or allowing a player to obtain a specific building type. Players sometimes choose to build in less valuable cities than they could for tactical scoring reasons. 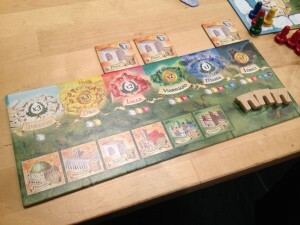 When built, the building tile is placed above the chosen city on their player board. On their turn, a player can choose to use one of their 6 scoring flags to score VPs and/or earn cash. A player can either score all of their buildings of a single type (i.e. all their libraries), or they can score all of their buildings at one city. Players can only score each of their building types once during the whole game (shown by placing their scoring flag on the relevant space on their player board). When it comes to scoring a city though, only one player can score each city during the whole game! So, if someone scores their buildings in the red city then no-one else can score their red city buildings. This is marked by placing the scoring flag on the city on the main board. When scored, each building tile earns its owner either VPs or cash (depending upon which city the building is in). The amount earned equals the city’s value multiplied by how many blocks (1-5) were used to build the building. For example, if I score my 3 Portas in the photo (right), I would gain 2×1 VP for the porta at the red palace, 2×3 cash for the porta at the green palace, plus 1×5 more cash for the porta at the black palace – giving a total of 2 VP and 11 cash. In addition to cash and VPs, players also take a wooden symbol from the supply (if there are any left) that matches each of the tiles. These are worth VPs at the end of the game. Once the game has ended, players score final VPs based on the objectives. In the basic game, players score 1 VP for each piece of marble used to build their buildings, plus 3 VPs for each wooden token, plus 1 VP for every 5 cash. The end of game scoring in the expansion can be quite varied such as awarding points for collecting sets of wooden tokens (rather than just 3 VPs each), etc. 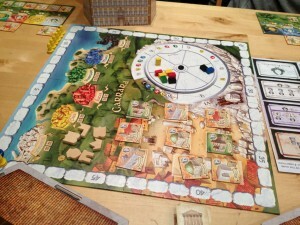 Overall, The Palaces of Carrara is a simple game but the interdependencies that lay under the surface are incredibly tightly woven together making everything you do critical to your success or failure, and this gives you a lot to think about and balance. At no time will you feel you have enough time, VPs, cash or marble to do all the things you want – in fact, you’re likely to feel that all these items are in crisis during most of the game. You’re converting cash into marble into buildings which give opportunities to gain cash or VPs. You never want to run out of cash, but don’t want lots left unused at the end. You need to balance building to gain cash versus building to gain VPs. Even then, you must also consider which cities can be scored, what building types you already have and can be scored, and how best to use your scoring opportunities. You want to use marble efficiently but sometimes it’s better to build in a lesser city so it can be scored or so it generates VPs instead of cash, or vice versa. So, there is always plenty to consider. There is a healthy tension to the game too: Will another player buy the blocks you want before you do? Will another player build the building you want before you do? Will another player score the city you want to before you do? Wooden markers are limited in number so, sometimes, you’ll score sooner rather than later (or score one way in preference to another) just so you can grab the few remaining wooden markers of one type before someone else does. Having to take an action to score is an interesting idea and players often don’t/can’t use all of their 6 flags by the end of the game. As you can only score each type of building once each game, you need to time this carefully so you maximise your gains but also so you gain the mix of cash and VPs that suits your needs. As each city is only scored by one player during the game, you need to watch your opponents too. The buying/wheel mechanic is clever as not only is it simple but purchases also change the prices (in a predictable way) and changes the mixture of coloured marble on sale (in an unpredictable way). Whilst there’s no direct player interaction, the game still feels interactive as players compete for the same marble blocks, building tiles and city scoring. Not only do players have some ability to deny things from their opponents, but there’s also a race element too. 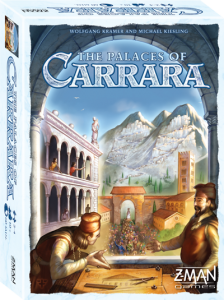 I really liked The Palaces of Carrara and thought it was an excellent Euro-game – I can see why it got it’s SdJ nomination. I’m looking forwards to trying it again using the expansion which alters how the VPs are earned at game end (such as awarding VPs for collecting sets of wooden flags which will add another decision factor to the game). The expansion also alters under what criteria a player can choose to end the game, as well as a few other items such as city upgrades during the game and value 8 buildings. 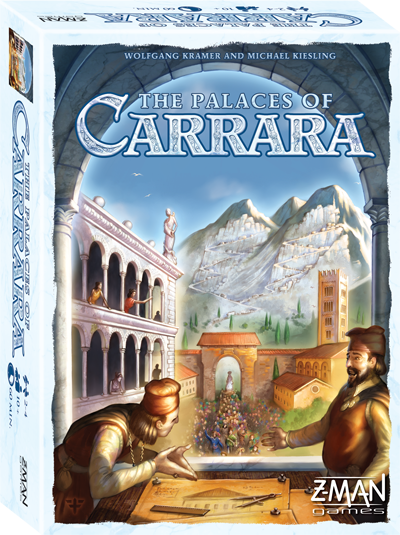 This entry was posted on Thursday, June 13th, 2013 at 12:30 pm	and is filed under Board Game Review, Board Games, The Palaces of Carrara. You can follow any responses to this entry through the RSS 2.0 feed. You can leave a response, or trackback from your own site.